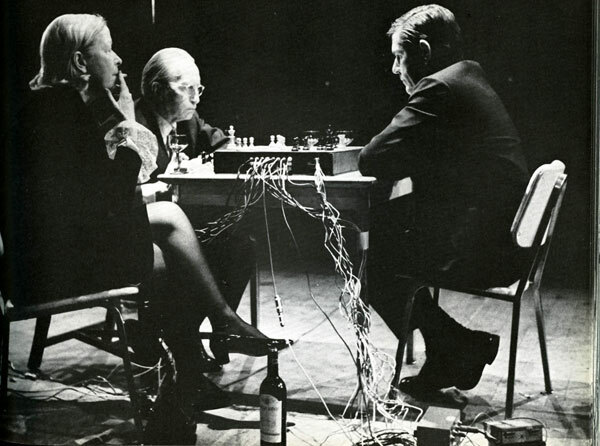 Reunion, 1968, Performance Marcel Duchamp and John Cage, chess game on sounding board, Photo: Shigeko Kubota. Reunion2012 was first presented during Ultima Oslo Contemporary Music Festival in 2012 as a work for electronically modified chessboard, chess players, electronic instruments and visual effects. The work bases itself on John Cage’s Reunion from 1968. The idea behind Reunion was to reflect the chess game’s flow and dynamics through sound by using a chessboard equipped with sensors which would register movements on the board, and which in turn would result in various sonic results. Reunion2012 is a technologically and artistically updated version of Cage’s original work, with a revitalised artistic expression and technology that ensures a higher degree of interaction between the chess movements and the sound. Magnetic sensors are mounted underneath each of the 64 squares on the chessboard—effectively turning the board into a matrix that influences the artistic result of the performance. 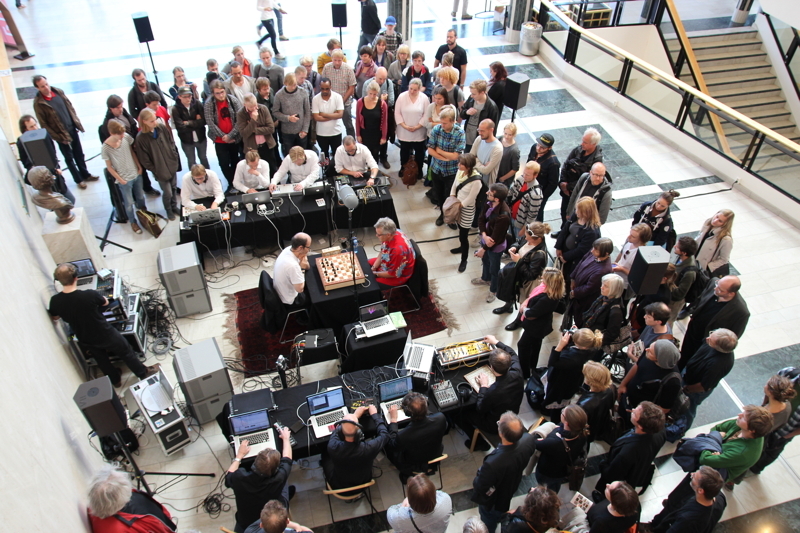 At the opening of Meta.Morf 2014 Reunion2012 will be presented in a concert format, where chess players will be playing with four electronic musicians, the musicians connected to the system are able to perform music based on the compositional framework defined by the chess game. Put simply, the chessboard acts as the conductor of the music. During the rest of the Meta.Morf 2014 biennale, Reunion2012 will be exhibited as an installation, where the audience can perform music by playing a game of chess where the game itself generates compositions in real-time. REUNION2012 is made by Eskil Muan Sæther, Anders Tveit (members of SkRR) and NOTAM -Norwegian Center for Technology in Music and the Arts. Anders Tveit is a composer and musician working with different projects related to electroacoustic composition and improvisation. Where the use of self-developed software for real-time processing has a central role in the personal musical expression. As a musician, he has worked with everything ranging from the international renowned Trondheim Jazz Orchestra, Audun Kleive, Shannon Mowday, Pd-Conception to more ad-hoc improvisation duos. In addition to being a performing musician featured on several CD releases, he has composed electro-acoustic music and sound installations. Tveit is also one of the driving forces behind the Oslo- based electronic music collective SkRR. Eskil works in a wide range of contemporary music genres, and has also been involved in a variety of film, art and installation projects. A trained musician with education from the Conservatorium van Amsterdam and the University of Oslo. Eskil is also one of the driving forces behind the Oslo-based electronic music collective SkRR. Øyvind Brandtsegg is a composer and performer working in the fields of algorithmic improvisation and sound installations. His main instruments as a musician are Hadron Particle Synthesizer, ImproSculpt and Marimba Lumina. As musician and composer he has collaborated with a number of excellent artists such as Oslo Sinfonietta, Motorpsycho, Kristin Asbjørnsen, Live Maria Roggen, Trondheim Jazz Orchestra, Trio Alpaca, Tre Små kinesere, Zeena Parkins, Maja Ratkje. Within the field of sound installations, he has produced both temporary and permanent works, for example “Flyndre” (2006-2016) and “VLBI Music” (2013-2020). In 2008, Brandtsegg finished his PhD equivalent artistic research project, focused on musical improvisation with computers. Øyvind has done lectures and workshops on these themes in USA, Germany, Ireland, and of course in Norway. Since 2010 he is a professor of music technology at NTNU, Trondheim, Norway. Tone is working with both electronic sound processing and acoustic sound, she explores new possibilities as a vocalist and interacts with her fellow musicians both in the traditional sense of being a singer, but also as a soundscaper, stretching the instrumental capabilities of the voice in the improvised interplay. Tone Åse has developed her work with electronic soundscaping through her long time collaboration in her own trio BOL with keyboard player Ståle Storløkken and drummer Tor Haugerud. In this trio she also contributes with her own compositions. Later on, being part of the early Live Maria Roggen Band and today the singer in Marilyn Mazur’s Future Song, she has explored and developed further her own way of working within different improvisational settings, with different, wonderful musicians. She has now, as part of her project as a research fellow in The National Norwegian Artistic Research Fellowships Programme, started several new collaborations working with musicians such as Per Oddvar Johansen, Krister Jonsson (S), Thomas Strønen and Michael F. Duch among others.